OMG, thank you, thank you, thank you. I have a cat that never defecated in the litter box. In fact he was my daughter’s cat and she couldn’t handle it any more, so she gave him to me. Tried everything – – multiple boxes, etc. No health issues. Friday after work (behavior advice removed). When I arrived home, I immediately (behavior advice removed). WITHIN HOURS no more defecating outside the box!!!! AND he covers his urine too, something he never did. Just urinated on top of the litter and walked away. Now I have to scoop down into the litter to find the urine and feces. I am telling everyone I know and my relatives and friends are amazed because they all knew about Capers and his out of box experiences (sometimes in the middle of the night stepping on it when they got up to use the bathroom, icky). Just wanted to extend extreme accolades! Barbara K.
Schedule a feline compulsive behavior consultation program with our certified cat behaviorist and founder of the clinic, Mieshelle Nagelschneider. She formally studied animal behavior at Oxford University, and The University of Edinburgh – The Royal School of Veterinary Studies. The “perplexing” feline compulsive disorders are solvable if the behavior is properly analyzed in a scientific diagnostic modality. Mieshelle has been solving these cat behavior issues with the clinic nationally and internationally since 1999 in over 30 countries. Help your cat with an issue that you probably didn’t realize has turned into a complex one. We have over 268 solved case studies and client testimonials. Pica, overgrooming, and excessive vocalization. Also, see vocalization here. These can begin as a simple issue, but then manifest into several issues rolled into one with many interdependent variables — anyone for a game of chess? 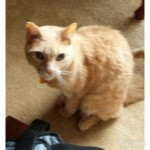 October Testimonial — “Our cat Pip hasn’t chewed on or eaten any clothing items or toilet paper for 3 weeks. This is literally a miracle, you have no idea. He seems so much happier and content and this all makes sense now after speaking with you. We can’t thank you enough for all your wisdom and for literally saving our cat’s life. Pip can NOT have another exploratory surgery! Talk to you in a few weeks on Skype after we return from our vacation.” — Katherine D. Fairfax, Virginia. First off, let’s understand that cats are not “obsessive” like humans can be. This term needs to be removed when describing a cat with compulsive behavior issues because it is incorrect. The correct term for cats with issues like chasing or attacking their tails, chewing or ingesting non-food items, or overgrooming, is compulsive disorder. Compulsive disorders in cats are not among the most common and require a behaviorist with formal education in animal behavior. Properly analyzing the behavior is the first step to results. For a variety of reasons, some of them similar to those that afflict people, cats and other animals can develop behaviors that we categorize as compulsive. The main cause of compulsive behaviors in cats is stress, especially when cats feel highly conflicted by two opposing courses of action. One compulsive behavior is what we call “wool-sucking” or wool-chewing – sucking or chewing on non-food items including not just wool, but cotton, synthetics, paper, and even more surprising materials. More commonly, cats may groom excessively or pull out their own fur, which is called overgrooming. Or they may attack their own tails or paw at their own faces (as part of “Rolling Skin Syndrome,” or feline hyperesthesia). Some compulsive behaviors appear to be passed on from parent to kitten. Other behaviors may develop because a cat was weaned too early, or because he’s now experiencing anxiety, frustration, separation anxiety, or cognitive conflict. This is especially true if such conflicts or frustrations recur frequently or persist over an extended period of time, such as when a cat who has separation anxiety is left alone every day with nothing to occupy or entertain him and no companionship, human, feline, or otherwise. What do I mean by “cognitive conflict”? Your cat is conflicted when she feels the urge to perform two opposing behaviors, such as an urge to greet you and an urge to avoid you for fear of punishment. Or when she wants to run away from another cat and she wants to confront him. Similarly, if you call a dog and he wants to come but can’t tell if you’re angry, his brain may short-circuit and his response may be to start spinning around. You can read more about this in the only scholarly-cited cat behavior book published in four languages available to cat owners on Amazon — The Cat Whisperer, published by Random House. A cat gets frustrated for the same reasons you do. He wants to do or have something and he can’t. Maybe he’s indoors, looking out a window, and he wants to attack the cat walking across his territory. Maybe he wants to play, hunt, stalk, kill, eat, but he has nothing to play with or no food. All animals have their characteristic ways of responding to boredom, frustration, and stress. In zoo environments, wolves, foxes, and polar bears may repetitively pace, crib, and self-mutilate, while giraffes sway and big cats pace. Gus, the famously neurotic polar bear at the Central Park Zoo, compulsively swims back and forth. Horses may chew repeatedly or weave as they walk, and pigs will bite their enclosure bars. Cats with separation anxiety (SAS) may grow upset when their owners leave home, and if left alone for too long may overgroom themselves. Compulsive behaviors in cats, including overgrooming and wool-sucking, are based on behaviors that are already a part of the cat’s natural repertoire, but that have become abnormal because they’re performed repetitively, out of context, with no apparent goal, and sometimes in ways that are destructive, not just to the environment they live in (yours!) but to the cats themselves. 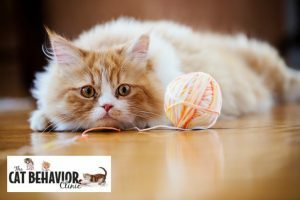 If you allow the stressor to continue, the behavior may be triggered by not only low amounts of the original stressor, but by totally unrelated stressors and eventually, no stressor is needed at all for the cat to perform the compulsive behavior. In short, one cat may develop compulsive behaviors because she’s been weaned too early, another because she’s anxious, and another because of a genetic propensity for, say, chewing on non-food items. Some compulsive behaviors may be harmful to your cat, and others may damage your property. Watching or listening to still others – lick, lick, pause. lick, lick, pause – may simply feel to you like Chinese water torture. Most cat owners and even most vets are at a loss as to how to intervene effectively to remedy compulsive behaviors. The most common compulsive behaviors are overgrooming and wool-sucking. These are some of the most difficult behavior issues to diagnose and treat, because they can be or act like physical health issues (like food allergies for instance). Solving this kind of behavior issue takes a very high level of expertise and of all the cat behavior issues, we strongly recommend never attempting to solve it on your own. We have worked with many clients whose cats had various forms of compulsiveness, and with long lasting success. We invite you to book your consultation today in order to give your cat, and you, relief! Dr. Jim Shultz performs in-home consultations locally only. for no reason, and even morph from calm to fierce in an instant. resting peacefully, when suddenly his skin starts to twitch or ripple. FHS episodes may actually be triggered by petting a cat in this region.